It’s been an open secret for some years now that the Bentley Continental GT has been due for replacement. That’s not because this sporting, gentlemanly and quintessentially British grand tourer has in any way lost its appeal – far from it: it remains as glamorous and desirable as ever, and a de rigueur purchase for Hollywood stars, Premier League footballers, basketball players and rappers, and all manner of aspirants thereto – but rather because the company had run out of ways to future-proof a basic design that now dates back almost 20 years. Those ageing fundamentals also involved a more deep-seated issue. Magnificent though the old GT is, it never completely transcended the limitations of a platform shared with the VW Phaeton, a solid, worthy but ultimately unsuccessful attempt to build a challenger to the Mercedes S-Class. Granted the engineers at Crewe wrought considerable magic, but these underpinnings were never entirely fit for purpose – the engine, for one, was placed too far forward in the chassis for ideal weight distribution. Thus, though the Continental could comfortably match the opposition from Ferrari and Aston Martin in terms of build quality, opulence, refinement and speed, at the outer edges of the dynamic envelope it lacked the necessary poise and precision for unqualified greatness. Did that matter? You could argue that it didn’t, for since its unveiling at the Geneva show in 2003, more than 65,000 Continentals have rolled off the production line, making it not only the British luxury motor manufacturer’s most successful product by a very wide margin but, by turning around its fortunes, also its saviour. Progressive revisions over a 15-year production cycle, including a major facelift in 2011 and, from 2012, a 4w-litre V8 alternative to 6-litre W12 power, ensured that this suave GT remained a machine not only of great charm and character, but also of impressive all-round capabilities. Yet as the engaging old trouper clearly couldn’t go on for ever, in July last year we were summoned to the factory for a first look at its successor. And though we weren’t expecting any paradigm shifts from the 2018 Continental, nor were we prepared to be confronted by such a breathtakingly confident statement of intent: that from the outset, this new Bentley would own the title of world’s greatest grand tourer. Inevitably for a company steeped in tradition, Bentley’s design language is evolutionary. That means the new car draws visibly on the outgoing GT, with a power line stretching back along the upper body from the nose and a characteristic haunch over the rear wheels (as with its predecessor, these tropes hark back to the early 1950s and the sublime grace of the Mulliner-body R-type coupe). Its dimensions, too, are broadly similar to the previous Conti’s, but thanks to an all-new MSB platform developed in cooperation with Porsche and shared with the second-generation Panamera, the front wheels have been shifted some 13.5cm forward, and the engine moved back and lowered. This gave the design team an opportunity to reduce the front overhang, and lengthen and lower the bonnet line, both of which contribute to a sleeker, sharper and edgier demeanour that should confidently carry Bentley’s biggest-selling product well into the next decade. Dynamically, the results are even more profound. Much the same story applies to every other aspect of the latest Continental. Like the older car it has all-wheel drive, but there the resemblance ends, for the new set-up involves an eight-speed dual-clutch gearbox driving through an electronically controlled, multi-clutch central differential that most of the time directs power mainly to the rear. Voluminous three-chamber air springs ensure levels of waft appropriate to a vehicle bearing the flying-B badge while simultaneously sharpening handling, as does the smart, 48-volt anti-roll system that massively enhances body control. Beneath the bonnet lies a 6-litre W12 – also like the old car, you say, but even in bog-standard form this mighty motor now produces 900Nm and 626bhp (and as Bentley’s late-lamented Supersports pumped out 700 ponies there’s the potential for plenty more). Soon to follow are V8, hybrid and rag-top variants, but until production is ramped up sufficiently we’re currently restricted to the 12-pot coupe. Not that that’s any great hardship, for the fixed roof focuses attention on a cabin that can only be described as fabulous: gleaming wood veneers of every texture and shade imaginable; nine unblemished bull hides, smooth, supple and stretched over seats and doors panels before being stitched into perfectly symmetrical double-diamond patterns with almost three kilometres of thread per car; and jewellery minutely detailed as if by a watchmaker – the optional Côtes de Genève console is exquisite. Pride of place here goes to the three-way rotating dashboard panel, which at the touch of a button displays a choice of 12.3-inch touchscreen, three analogue gauges or simply (if such a word can be applied) an expanse of perfectly matched veneer. Although it’s an unusually contemporary take on luxury, I’ve rarely seen an interior as lavish as this, or one that’s quite so superbly driver oriented. It’s all carried over to the rear of the cabin, though as this new Continental GT is more 2+2 than full four-seater the chairs in the back are as much for show as function. 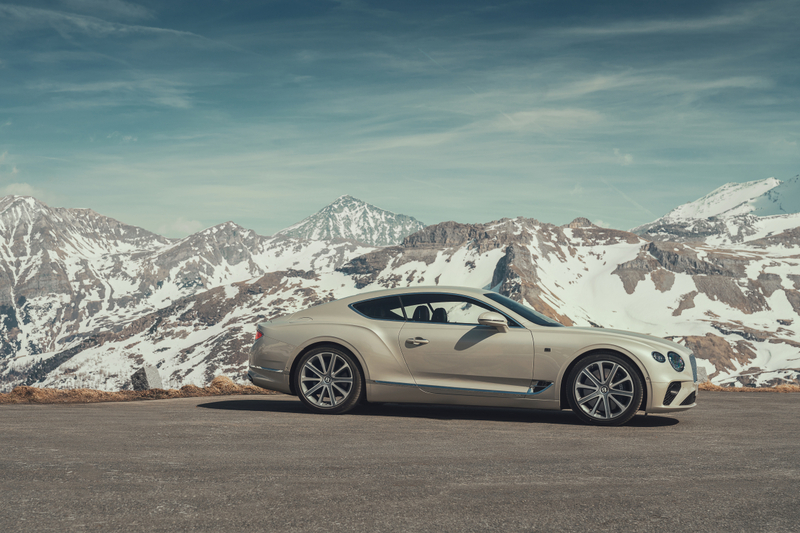 As Bentley wants us to assess its baby in its natural habitat (which for grand tourers traditionally means Europe) we’ve come to Austria, where a 400km-long route mapped out through the Alps takes in the tortuous Grossglockner-Hochalpenstrasse, rising above 2,500 metres and the highest pass in the country. It’s another clear statement of confidence in the car’s ability to dazzle on some of the continent’s most arduous roads. Although around 80kg lighter than its predecessor, due mostly to a widespread use of aluminium, the GT still weighs the better part of 2.3 tonnes, which immediately begs the question: can it really convince as an athlete on terrain such as this? Within just a few minutes, however, it’s evident that this is an entirely different proposition from the older car. In sport mode and using launch control – when just 17 percent of torque is diverted to the front wheels and the normally discreet twin-turbo W12 audibly growls and even crackles – the car can hit 100km/h in just 3.7 seconds, but even with the selector set to the recommended Bentley setting and the gearbox in auto it’s blisteringly fast off the mark. Moreover, kickdown on the dual-clutch transmission and response from the 12-cylinder are more or less instantaneous. On a short stretch of autostrada (we briefly cross over into Italy), I floor the pedal, the gearbox snaps down a ratio or two and the speed piles on relentlessly until at 235km/h I’m forced to back off for a fast-looming curve. Yet if the way this thing gathers pace is extraordinary, so is the ability of its massive brakes to slow it down. Bentley says they’re the biggest rotors ever fitted to a motor car (they certainly look it when viewed through the spokes of the test car’s 21-inch alloys), and as the Continental GT can top 333km/h it’s a claim I’m quite happy with. Road behaviour, too, is astounding for a machine of this size and heft. Of course it’s no Fezza or McLaren, but there’s a finely honed sharpness, fluency and precision to both the handling and steering, and as we climb high up into the mountains the enormous traction and grip are equally reassuring. The car feels eager while turning into switchbacks, but it’s also planted, safe and stable – and the body always beautifully controlled – yet rotate the diamond-knurled dial to Sport and hit the traction button and you can even hang the back end out. No matter how fast or furiously we’re travelling, however, I’m constantly struck by the pliancy of the chassis, the reliably cushioned ride and the silence of that sumptuous interior. There are plenty of cars these days that are insanely rapid and great fun to drive, but in how many of them, honestly, would you care to spend hours – and perhaps even days – pounding down highways, through valleys and over hills, as the kilometres disappear behind you in their hundreds? I’d bet there aren’t many. There’s one, though, for sure. Because if your idea of heaven is simply to get into a car and go – whether that means a jaunt across town or pointing yourself towards some distant horizon – you’re unlikely to find a better candidate than the new Bentley Continental GT. Immensely fast, gorgeously luxurious and quite staggeringly capable, it really is the grand tourer par excellence.